Posted on August 19, 2010	by Lou Murray, Ph.D.
I’ve been too busy trying to keep up with my own garden and raise funds to start up the new Huntington Beach Community Garden to make my Harvest Monday post. I got a detailed budget worked out for the community garden, and we’re going to need about $25,000 each in materials and labor for a total budget of $50,000. We already have pledges for in-kind donations of about $14,000, plus we’ve raised several thousand dollars already by selling laser-engraved bricks, so we’re on our way. I hope to get that garden up and running late this fall, and plant some winter crops there in December. But, oh what a lot of work is going to need to be done before then. Well, on to my own garden at home. I have both male and female flowers on my Summertop cucumbers. They are the best cucumber vines I’ve ever grown, so I’m hoping for some good cukes yet this season. My Boston pickling cukes were a bust. The Tendergreens in a pot gave me very few cukes. Go Summertops. A green Savoy cabbage is heading up. 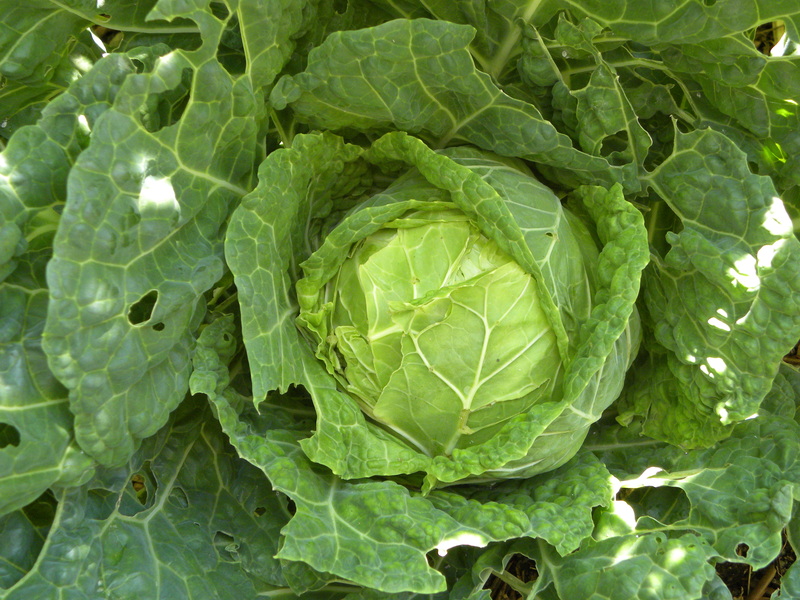 My winter cabbages didn’t do much, but these that I grew from seed and planted in spring may give me some cabbages yet. I have three of them surviving. Other than that, I didn’t get around to taking any photos, so on to the harvest, which was mostly green beans and tomatoes. Not that I’m complaining. Subtotal Vegetables 7 lbs 14 oz. If you had a harvest, visit Daphne’s Dandelions and post it on Mr. Linky. It is always better choice to do some gardening than blog about gardening. Looking forward to see pics from that new Community Garden. Vrt, I’m glad that you agreed with my choice of whether to garden or blog. I can hardly wait to get our community garden up and running. But we have a lot of work and a lot of fund-raising ahead of us.